Finished Size: 31½ (36¼, 41, 45½, 50¼, 54½)“ bust circumference, buttoned. 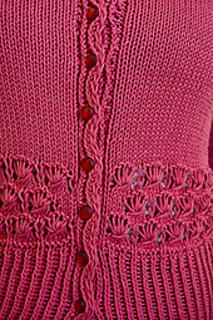 Cardigan shown measures 36¼”, modeled with about 2” positive ease. Yarn: Rowan Milk Cotton DK (70% cotton, 30% milk protein; 124 yd 113 m/50 g): #087 tutti frutti (coral), 7 (8, 9, 10, 11, 12) skeins. Yarn distributed by Westminster Fibers. Needles: Body and sleeves—size 5 (3.75 mm): 29” circular (cir) and double-pointed (dpn). Clam st section—size 4 (3.5 mm): 29” cir and dpn. Adjust needle sizes if necessary to obtain the correct gauge. Notions: Markers (m); stitch holders; tapestry needle; 11 (11, 11, 11, 12, 12) 7⁄16” (11 mm) shank buttons; dental floss or heavy sewing thread for knit-in button attachment. Additional Gauge: 20 sts and 30 rows = 4” in 1×1 twisted rib on larger needles; 20 sts and 24 rows = 4” in clam st on smaller needles. The clam motif has five decreases and five double yarnovers worked into a single group of five elongated stitches. You may find it helpful to use a tightly plied yarn and needles with sharper tips. Be careful when dropping the double yarnovers of the clam-stitch patterns so that you do not accidentally drop a real stitch. The form-fitting sleeves are worked in the round to the start of the cap shaping to avoid the bulk of sleeve seams. Be sure to check your stockinette gauge in the round as well as in rows. If your stockinette in the round has a different gauge from working in rows, adjust needle size to achieve the stated gauge. This sweater is designed to be work with minimal ease so that the twisted-rib and clam stitch sections can lie close to the body rather than blousing out, even though they have slightly looser gauges than the main stockinette fabric. Taking this into consideration, you should still select a size with enough east to prevent the front bands from gapping. Pattern located on page 48 with photos on page 29.